Credit: 352709(Photo by Jared C. Tilton/Getty Images for Texas Motor Speedway) Erik Jones, driver of the #20 GameStop/Call of Duty WWII Toyota, celebrates in Victory Lane after winning the NASCAR XFINITY Series O’Reilly Auto Parts 300 at Texas Motor Speedway on November 4, 2017 in Fort Worth, Texas. 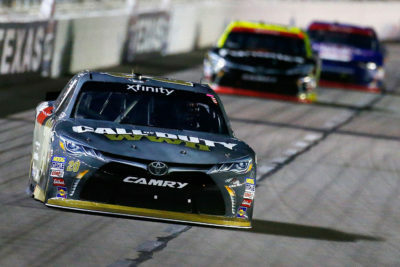 Starting from pole Car 20 Erik Jones GameStop/Call of Duty WWII Toyota won the 13th Annual O’Reilly Auto Parts 300, his 9th win in 76 NASCAR XFINITY Series races. This is his 3rd win & 9th Top 10 finish in 2017. 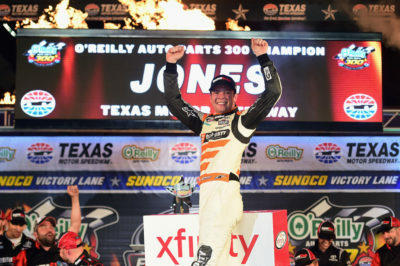 This is his 3rd win & 6th Top 10 finish in six races at Texas Motor Speedway. 2nd Place Car 22 Ryan Blaney Discount Tire Ford, started from 4th place posted his 5th Top 10 finish in 5 races at Texas Motor Speedway. It is his 11th top-10 finish in 2017. 3rd Place Car 42 Kyle Larson ENEOS Chevrolet, started from 10th place posted his 4th Top 10 finish in 8 races at Texas Motor Speedway. 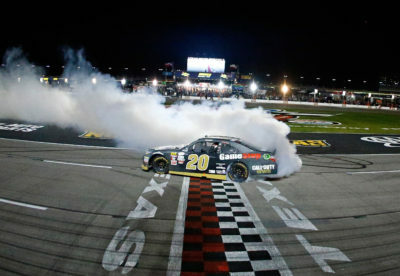 Credit: 352703(Photo by Matt Sullivan/Getty Images for Texas Motor Speedway) Erik Jones, driver of the #20 GameStop/Call of Duty WWII Toyota, celebrates with a burnout after winning the NASCAR XFINITY Series O’Reilly Auto Parts 300 at Texas Motor Speedway on November 4, 2017 in Fort Worth, Texas. 4th Place Car 1 Elliott Sadler Dale’s Pale Ale Chevrolet, started from 5th place. 5th Place Car 00 Cole Custer # (P) Haas Automation Ford, started from 2nd place was the highest finishing rookie. 6th Place Car 18 Christopher Bell Safelite Toyota, started from 8th place followed by 7th place Car 48 Brennan Poole (P) DC Solar Chevrolet, started from 12th place. 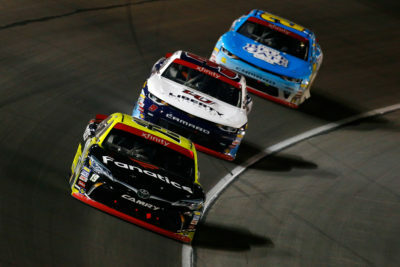 8th Place Car 19 Matt Tifft Surface Sunscreen/Fanatics Toyota, started from 3rd place followed by 9th place Car 9 William Byron # (P) Liberty University Chevrolet, started from 9th place. Lastly in the Top 10 was Car 2 Austin Dillon Rheem/WATTS Chevrolet, in 10th place, started from 7th place. Elliott Sadler (P) leads the point standings by 5 points over William Byron # (P). 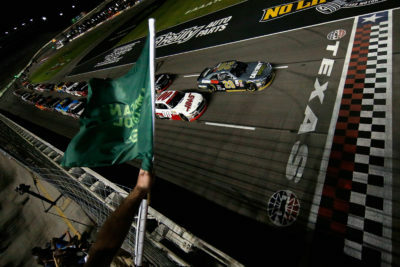 Credit: 352700(Photo by Brian Lawdermilk/Getty Images for Texas Motor Speedway) Erik Jones, driver of the #20 GameStop/Call of Duty WWII Toyota, leads Cole Custer, driver of the #00 Haas Automation Ford, to the green flag to start the NASCAR XFINITY Series O’Reilly Auto Parts 300 at Texas Motor Speedway on November 4, 2017 in Fort Worth, Texas. The race had 17 Cautions for 33 Laps: 1st Caution on lap 10 for Car 3 Ty Dillon Bass Pro Shops/Tracker Boats Chevrolet Spin in Turn 2. 2nd Caution on lap 47 for Stage 1 Conclusion. 3rd Caution on lap 57 for Car 78 Angela Ruch Give A Child A Voice Chevrolet Crash in Turn 4. 4th Caution on lap 62 for Car 33 Brandon Jones Rain-X/Advance Auto Parts Chevrolet Crash on the backstretch. 5th Caution on lap 83 for Car 18 Christopher Bell Safelite Toyota Spin in Turn 2. 6th Caution on lap 92 for Stage 2 Conclusion. 7th Caution on lap 126 for Car 24 Dylan Lupton Nut Up Toyota Spin in Turn 4.
Credit: 352707 (Photo by Jonathan Ferrey/Getty Images for Texas Motor Speedway) Erik Jones, driver of the #20 GameStop/Call of Duty WWII Toyota, leads a pack of cars during the NASCAR XFINITY Series O’Reilly Auto Parts 300 at Texas Motor Speedway on November 4, 2017 in Fort Worth, Texas. 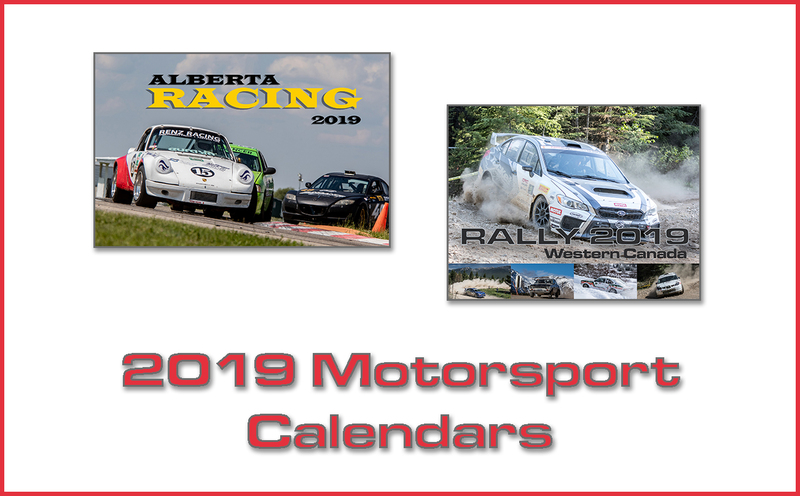 The race had 10 Lead Changes among 6 drivers: Lap Leaders: E. Jones(i) 1-48; W. Byron # (P) 49-65; E. Jones(i) 66-80; K. Larson(i) 81; E. Jones(i) 82-93; R. Blaney(i) 94-127; E. Jones(i) 128-185; K. Larson(i) 186-188; M. Annett 189; T. Dillon (i) 190-191; E. Jones(i) 192-200. 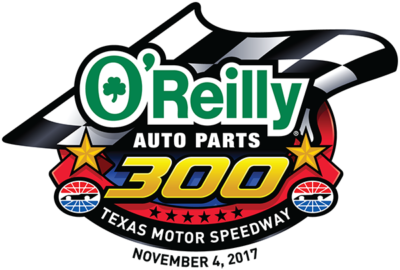 Leaders Summary (Driver, Times Lead, Laps Led): E. Jones(i) 5 times for 142 laps; R. Blaney(i) 1 time for 34 laps; W. Byron # (P) 1 time for 17 laps; K. Larson(i) 2 times for 4 laps; T. Dillon(i) 1 time for 2 laps; M. Annett 1 time for 1 lap. 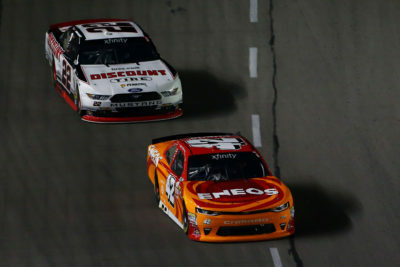 Credit: 352705(Photo by Sarah Crabill/Getty Images for Texas Motor Speedway) Kyle Larson, driver of the #42 ENEOS Chevrolet, leads Ryan Blaney, driver of the #22 Discount Tire Ford, during the NASCAR XFINITY Series O’Reilly Auto Parts 300 at Texas Motor Speedway on November 4, 2017 in Fort Worth, Texas. Credit: 352706(Photo by Jonathan Ferrey/Getty Images for Texas Motor Speedway) Matt Tifft, driver of the #19 Surface Sunscreen/Fanatics Toyota, leads William Byron, driver of the #9 Liberty University Chevrolet, and Daniel Hemric, driver of the #21 Blue Gate Bank Chevrolet, during the NASCAR XFINITY Series O’Reilly Auto Parts 300 at Texas Motor Speedway on November 4, 2017 in Fort Worth, Texas. Race Comments: Prior to the green flag, the following cars dropped to the rear of the field under penalty: No. 4 and 5 (unapproved adjustments). Failed to Qualify: N/A. Average Speed of Race Winner: 133.862 mph. Time of Race: 02 Hrs, 14 Mins, 28 Secs. Margin of Victory: 1.018 Seconds. Caution Flags: 7 for 33 laps: Laps. Lead Changes: 10 among 6 drivers. Coors Light Pole Award: Erik Jones, #20 191.272 mph. Mahle Clevite Engine Builder of the Race: Joe Gibbs Racing Engines – Mark Cronquist, #20. Mobil 1 Driver of the Race: Erik Jones, #20. Sunoco Rookie of the Race: Cole Custer, #00.